I’m pretty lazy when it comes to taking vitamins. In fact, all five of the different bottles of tablets sitting on my kitchen counter are more than 2/3 full, and all of them are expired. I simply forget to take them—something I was reprimanded for the other day when I met Steven Joyal, M.D., vice president of scientific and medical affairs of Life Extension, a health and dietary supplement company. “It’s virtually impossible to get all the essential nutrients you need from foods alone, so you should at least be taking a daily multivitamin,” he says. I sat there nodding politely, mentally kicking myself for wasting money on those past-dated pills. Vitamins and minerals help our bodies work as efficiently as possible, but they’re especially important for athletes because we put more than just the normal wear and tear on ourselves. As runners, we’re constantly subjected to cancer-causing free radicals when we run outside—from the sun, pollution, and other sources. Plus, our activity causes internal stress (the break down and repair of muscle tissue, for example). Which means loading up on antioxidant-rich fruits and veggies and popping a daily multivitamin are key to running farther, faster, and for life. Magnesium Sweat a lot? You could be low on this mineral, which escapes the body through perspiration. Magnesium is responsible for maintaining muscle and nerve function, keeping your heart rate steady, and fortifying bones. Calcium If you want to reduce your risk of stress fractures, this one’s for you. Three servings of dairy a day should put enough calcium in your diet, but the body often utilizes it more effectively when it’s taken as a supplement paired with magnesium and other minerals. Vitamin D Vitamin D helps the body absorb calcium, making it vital for strong bones. Your body naturally makes it when it’s exposed to UV light. But when days become short on sunlight (hello, winter), a supplement can fill the gaps. 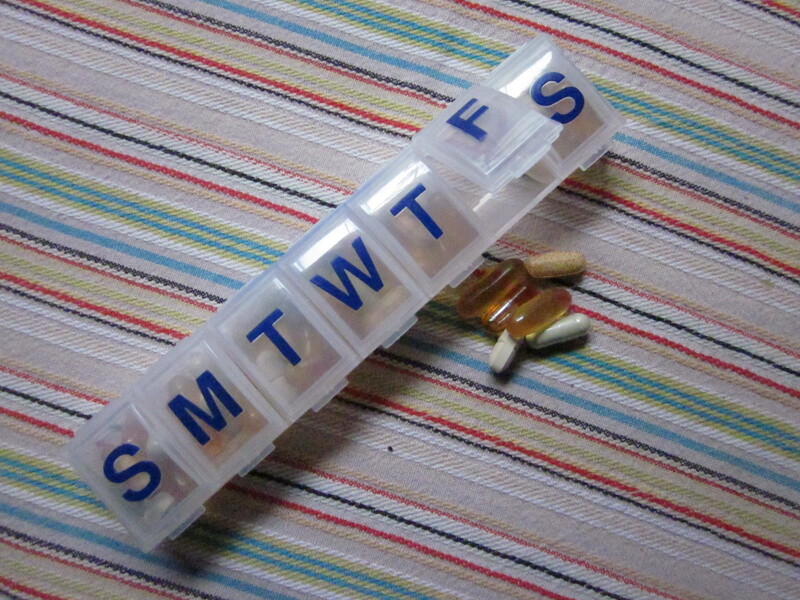 I bought a new set of vitamins and Dr. Joyal gave me this handy-dandy sorter to help me remember to take them everyday. (Yes, Gramma, it’s just like yours!) This morning I successfully swallowed all of my pills. My fingers are crossed. Are you good about popping pills? How many vitamins do you take daily? Didn’t know you had this on top of the Shape blog! I’ll be sure to bookmark you. :) Last I heard, you were running the NYC Marathon? Is that still the plan? I’ll be there!